92 pages | 3 B/W Illus. This book describes the history of gold as a financial instrument and discusses gold exchanges in the major markets. It also describes the history of the Chinese Gold & Silver Exchange Society (CGSE), its current organizational structure and membership registration system. 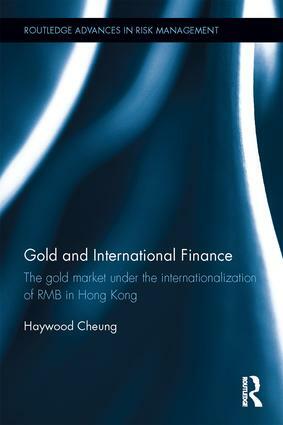 The book also includes the development and growth of the gold market in Hong Kong and the role played by CGSE in the growth of the Chinese gold market. It includes a brief description of the CGSE in the twenty-first century – its current role and what it may play in the future. The book explains factors that influence gold price and the mechanism of price formulation. It also describes the historic trends in the demand and supply of gold and the global inventory of gold, trends of the demand for investment holdings, jewelry manufacturing and industrial usage. The book also compares the movements in gold price with inflation and analyzes the data on how gold provides a hedge against inflation. It also examines and explains the relationship between gold and the US dollar (USD) and the correlation between dollar index (value of dollar against 16 major currencies) and gold price. It explores in depth on the relationship between gold price, output and inventories and major economic indices. This is a good reference for those interested in the comprehensive view of gold and its importance in the world economies. Haywood Cheung has over 30 years of experience in precious metals trading, securities and futures brokerage and forex dealing in Hong Kong. He is currently the President of the Chinese Gold & Silver Exchange Society, the Chairman of Hong Kong Precious Metals Exchange Limited and the Permanent President of Hong Kong Precious Metals Traders Association Limited.